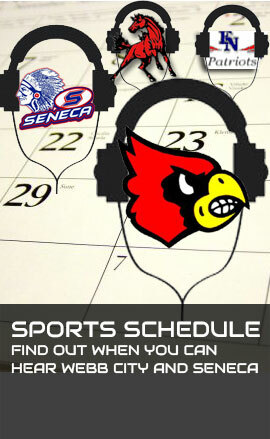 The KNEO Sports Network is the official home for the Webb City Cardinals and the Seneca Indians athletics.The KNEO Sports Network also broadcasts sporting events for McDonald County High School and Crowder College. Whether you're listening to a game live on 91.7 FM or live on the Internet at kneo.org, The KNEO Sports Network will provide you with the most in-depth coverage of local high school athletics in the area. Did you know we have audio stream apps for Apple and Android products? Listen to KNEO anytime, anywhere! (Data charges may apply). Want to relive a past game? We keep an active archive of the past season for Webb City Football, Softball, Basketball and Baseball. Get the latest scores from around the area on Friday nights (Football only). Hear from a different coach or director in the Webb City School District each week on "The Cardinal Minute." Hear from a different coach or director in the Seneca School District each week on "The Indians Minute." Hear various trainers each week from Freeman Orthopaedics and Sports Medicine describe some of the common injuries athletes can get and how they should treat them. Join Adam Winkler each week as he catches up with a former Webb City Cardinal athlete. They will look back on their high school days and then find out "Where Are They Now?"